"This fool cow won't sit on a bottle." 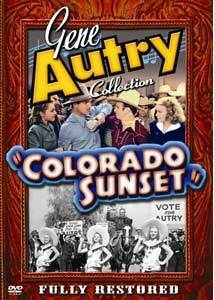 Colorado Sunset was treated as a special entry in Autry's long-running series of films for Republic, and it's worthy of the treatment. The budget's a little bigger, the story is a little more solid than usual, and there are a passel of great guest stars, making it a B western delight from beginning to end. Gene's sidekick Frog Millhouse (Smiley Burnette) accidentally buys a dairy farm instead of a cattle ranch. Gene opts to make the best of it, and tries to fit in to life in Barton County. But the other dairy farmers are having trouble, since a trucking company is apparently forcing them to pay an additional fee for hauling their milk. A protective association has been formed by the local veterinarian, Doc Blair (Robert Barrat), but it may be even more sinister than the trucking company. Also featured are Buster Crabbe as the crooked deputy, Dave Haines, and Autry leading lady June Storey as Haines' sister Carol. The guest stars are pretty notable, starting with Crabbe in an unusual role as a villain, which he takes on with a vengeance. Storey is charming as usual, and Barbara Pepper, better known as Doris Ziffel from Green Acres is prominently featured as one of Gene's allies as he tries to clean up the town; a far cry from her character 30 years later, the young Pepper is quite a dish. The movie even boasts not one but two screen Tarzans, as original ape man Elmo Lincoln is featured in a small part. Another silent film actor, William Farnum, makes a memorable appearance as the clueless sheriff who falls victim to the schemes at work under his nose. Burnette is in absolutely top form with highly amusing comic relief; at one point he completely cracks up Autry but the take is so good that it stays in the film. Burnette also contributes several comic songs that are entertaining. But that's not all. Country music legend Patsy Montana makes her only motion picture appearance and introduces her hit I Want to Be a Cowboy's Sweetheart in a vigorously rousing version backed by The Texas Rangers. Weirdly, the track listing in the keepcase takes the negative tack, entitling the classic song I Don't Want to Be a Cowboy's Sweetheart. Someone at Image's heart isn't quite into this project, it seems. The many songs are almost all delightful, with only the title tune, oddly enough, being somewhat of a clunker. The combination of music, comedy and action is one of the best in the Autry canon. There are even some political complications (with the women of Barton County taking the lead) and a foreshadowing of wartime films in the use of coded radio messages (unknowingly delivered by Storey) to direct terrorists to their targets. The supplemental materials make it clear this was a troubled production (the script wasn't finished until two days before shooting completed) but it holds together surprisingly well under the circumstances. There's plenty of western action and some thrilling chase sequences are included in between the music and comedy. Image Transfer Review: The restored print seems to be assembled out of several different prints; the title sequence notes that it's from a re-release print. Much of the film looks fine, while isolated scenes look dupey and suffer from substantial flicker. The softer scenes have some unpleasant edge enhancement added in a misguided attempt to make them look better. For the most part, the greyscale is quite attractive, with reasonably good shadow detail. Speckling is common but there's no major damage. Audio Transfer Review: The 1.0 English audio track has quite a bit of noise and hiss throughout, though the songs sound a bit better than the dialogue segments. There isn't much that can be done about that, and one shouldn't expect a first-rate soundtrack. Range is limited and the tone is a bit on the bright side. Extras Review: The usual materials on the Gene Autry Collection return with a bit more substance than is typical, starting with the 1987 Melody Ranch Theater introduction (13m:30s) with Gene and Pat Buttram. This one sticks right on the topic, as Autry relates his recollections of working with Crabbe (who would shortly go on to star in his own cowboy series for PRC), the elaborate London premiere of the film, and Autry's succeeding stage tour of Britain and Ireland as World War II descended on the country. An episode of Gene's radio show, Melody Ranch, from August 4, 1940 is included here, since the program wasn't yet on the air when this film was released. The production reports include the full shooting schedule of 10 days, information about the budget running over by $971.19, with the excuse that the budget was made up for an entirely different script and that the film had to be largely written and improvised during the shooting itself. These materials haven't usually been too interesting on other discs, but the batch on this DVD is downright fascinating for anyone interested in the process of making a B Western in the 1930s. More of this detailed kind of material would certainly be welcome in the future. A set of galleries with over 60 stills, a set of lobby cards, several posters and presskit ad copy are supplemented by a set of production notes. A very satisfying assemblage of material in support of the picture. One of the most thoroughly entertaining of Autry's films gets a nice presentation, though the source print is a little rough.